Increasing time-to-market pressures have led to the availability of full-featured microcontrollers, sometimes called system-on-chip (SoC) processors. These feature-rich microcontrollers or SoCs speed design by integrating a part of or, in some cases, all of the hardware required to implement an embedded design. Developers can then focus their design efforts on application-level functionality. Greater integration, however, also leads to greater processor complexity. Depending on the microcontroller, it can be challenging for developers to quickly evaluate it for a particular application. To ensure that developers can evaluate the intended functionality of their microcontrollers, semiconductor manufacturers offer peripheral boards and basic development boards. In the past, semiconductor manufacturers typically used a proprietary interface for their development boards, which required them to develop not only the basic development board for a microcontroller, but peripheral boards as well. As a result, these proprietary interfaces often limited how quickly a manufacturer could support new microcontrollers. With the rise of the hobbyist market and various embedded developer communities, semiconductor manufacturers can now utilize popular standard interfaces such as Arduino, Raspberry Pi, and mbed for their development boards. These standard interfaces enable customers to easily switch between one development board and another without having to worry about changing peripheral boards. They also enable the embedded solution suppliers to provide a wider range of peripheral boards that can work with different development boards based on the same standard interface. Today, developers can use these standard-based development boards for their initial evaluation of a microcontroller. However, when it is time to prototype their design, customers have to build their own hardware modules, as the form factor and cost of these development boards often restrict their usage in a prototyping environment. To ensure developers can evaluate their silicon in a prototyping platform, silicon manufacturers and other embedded solution suppliers have begun to offer low-cost development boards in an easy-to-use form factor based on standard interfaces. This enables the engineers to not only evaluate the microcontroller but also prototype their embedded designs using the same development board. These development boards often come with a generic breadboard-compatible interface, enabling the engineers to design these boards into their desired prototyping platform. These development boards not only allow developers to prototype their designs more easily, but they also enable hobbyists to create their next project without having to worry about creating a new platform for their application. There are a variety of such prototyping-ready boards available on the market today. 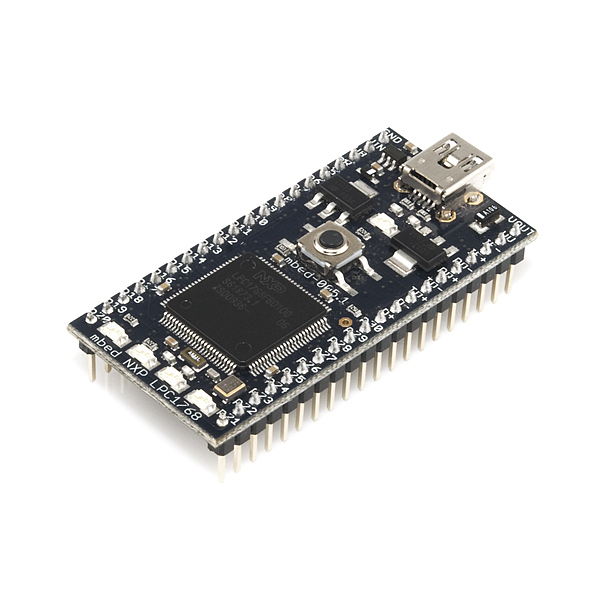 Each offers a unique set of features including smaller form factor, a breadboard-compatible interface, and an onboard programmer and debugger (Table 1). 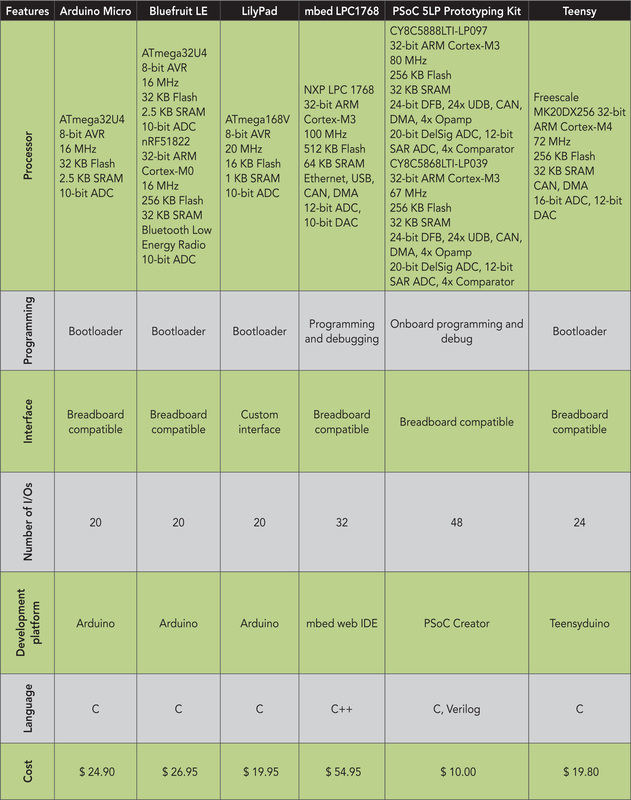 Table 1: A prototyping board comparison. The Arduino Micro (www.arduino.cc/en/Main/arduinoBoardMicro) is a development board developed by Arduino and Adafruit. This tiny development board is based on the ATmega32U4 microcontroller and comes in a breadboard-compatible form factor, which makes it easy to interface with. It also exposes 20 digital input/output (I/O) pins and features a built-in USB to communicate with a PC on its own. 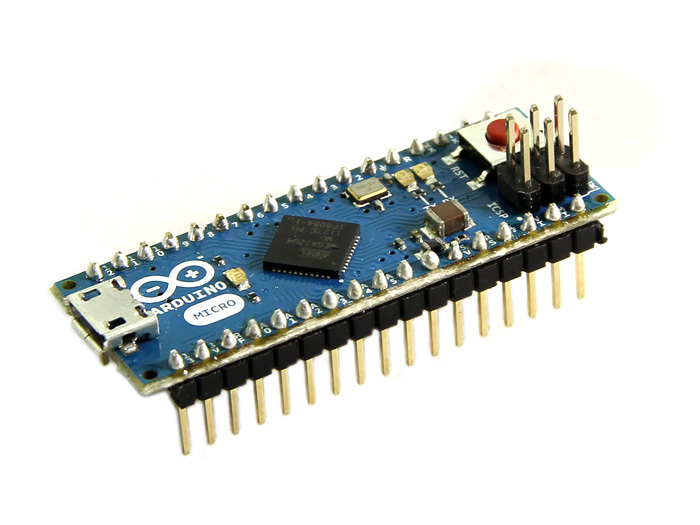 The Arduino Micro comes with a pre-programmed bootloader firmware, enabling users to download new firmware without having to connect an external programmer/debugger. The Bluefruit LE (www.adafruit.com/products/2661) is a prototyping board developed by Adafruit. 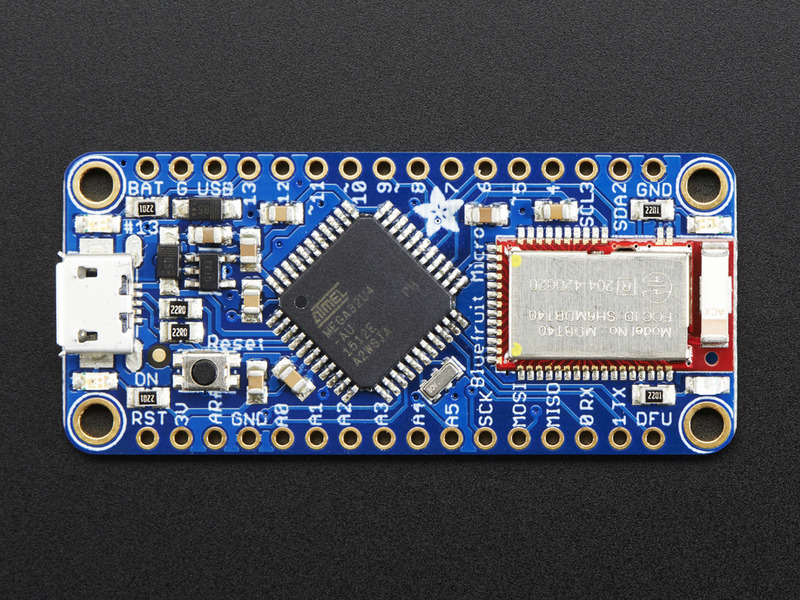 This board features an ATmega32u4 interfaced with a Nordic Bluetooth Low Energy radio (nRF51822) over a serial peripheral interface (SPI). This breadboard-compatible development board exposes 20+ general-purpose I/O (GPIO) pins for application development. These GPIO pins support I2C, SPI, a universal asynchronous receiver/transmitter (UART), and 6 analog inputs. Pre-loaded with a bootloader project, the Bluefruit LE lets users program their applications without the need of an external programmer. 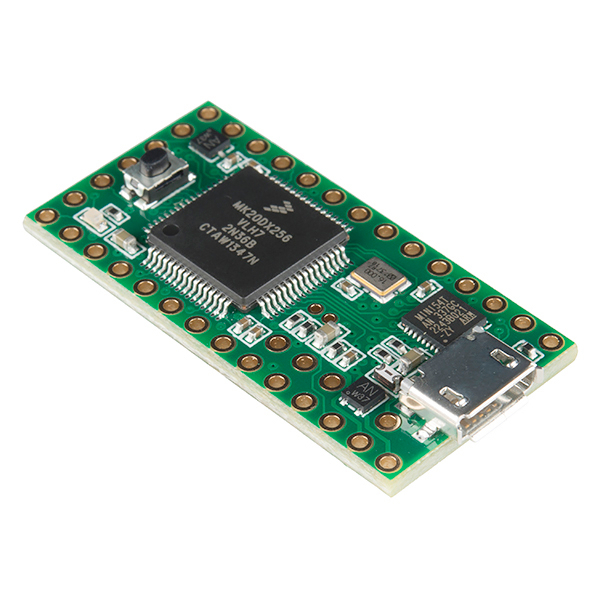 The Bluefruit LE board also features an iOS and Android app that can be used to communicate with the Nordic Bluetooth Low Energy module. 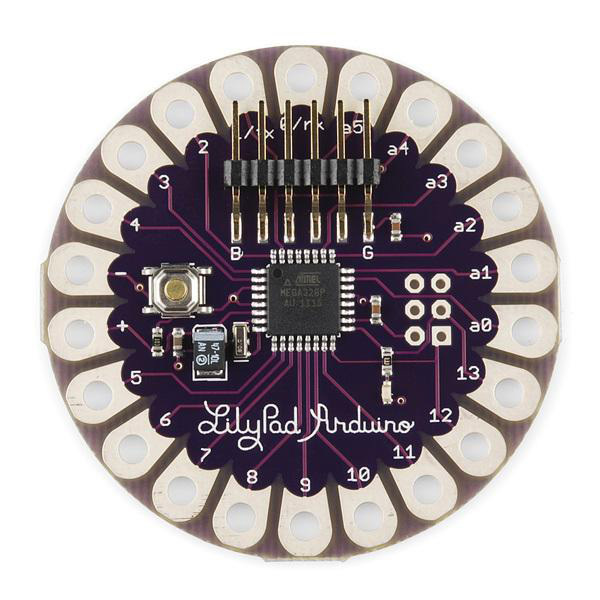 LilyPad (lilypadarduino.org) is a unique development board designed by Arduino for wearable applications. This board can be sewn on clothes using conductive threads. This board is based on the ATmega168 microcontroller and exposes a total of 20 I/Os (14 digital I/Os and 6 analog I/Os), which can be used to interface with a variety of digital or analog sensors. Similar to any other Arduino platform, LilyPad Arduino comes pre-programmed with a bootloader. Users can download new firmware via Arduino software. The mbed LPC1768 development board (developer.mbed.org/platforms/mbed-LPC1768) is based on an ARM Cortex-M3 processor, which has a rich set of peripherals including USB, Ethernet, CAN, and serial protocols. This development board also comes in a breadboard-compatible form factor and exposes 32 I/Os. The mbed platform supports programming of the target device via standard CMSIS-DAP or the mass-storage programmer mode, where users can simply drag and drop a binary file to program the device. The mbed is a web-based platform that allows users to write programs in C++, providing access to a wide variety of mbed libraries. PSoC 5LP Prototyping Kit (www.cypress.com/documentation/development-kitsboards/cy8ckit-059-psoc-5lp-prototyping-kit) is a low-cost platform by Cypress that enables users to prototype designs with the ARM Cortex-M3 PSoC 5LP device. The PSoC 5LP device features a 24-bit hardware digital filter block (DFB) coprocessor, CPLD-based Universal Digital Blocks, high-performance direct memory access (DMA) controller, high-precision 20-bit analog front ends (AFE) with Programmable Analog Blocks including opamps, programmable gain amplifiers (PGA), filters, comparators, successive approximation register (SAR), and Delta-Sigma analog-to-digital converters (ADC), and the CapSense capacitive touch-sensing solution. This prototyping kit comes in a breadboard-compatible form factor and exposes all of its 48 I/Os for application development. This board features a unique snap-away onboard programmer and debugger, based out of another PSoC 5LP device. This onboard programmer and debugger can be used to program and debug the target PSoC 5LP device and also supports serial communication protocols. The onboard programmer and debugger can be bootloaded to implement any custom applications. Teensy 3.1 (www.pjrc.com/teensy) is a breadboard-compatible prototyping-ready development board that exposes 24 I/Os of the onboard microcontroller unit (MCU). It features a Freescale ARM Cortex-M4 MCU device that supports 256K flash and peripherals such as 12-bit DAC, dual ADC, and CAN. This development board comes pre-programmed with a USB bootloader and supports application development via Teensyduino, an add-on for Arduino IDE. Today’s silicon manufacturers and embedded suppliers provide low-cost breadboard-compatible development boards to enable developers to both evaluate and prototype their designs using the same hardware. With some of these development boards costing as little as $10, the decision whether to design a custom development board or use an off-the-shelf, breadboard-compatible, ready-made development board is no question. The convenience of being able to have several prototyping-ready boards available in the development workspace simply makes design the next disruptive electronics product much easier. Pushek Madaan is Senior Product Marketing Engineer at Cypress Semiconductor. Gagan Luthra is Product Marketing Manager at Cypress Semiconductor.